Funnel Fingers are a twist on classic funnel cake. Concession staff can pour batter for 6-count servings into the molds to create a portable snack that can be easily dipped. The fingers can be paired with icing cups, chocolate sauce, fruit toppings and whipped cream to further increase concession revenues. 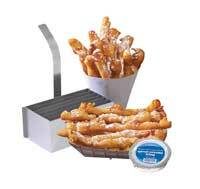 The manufacturer also offers gas and electric funnel cake fryers.